Stephen Baxter says he’s looking forward to locking horns with old friend Harry McConkey when Crusaders face Ballinamallard United in this year’s Irish Cup final. 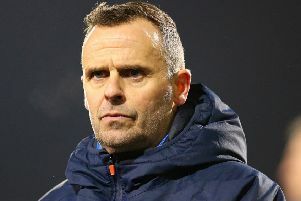 The Mallards may be the unlikely part of that pairing, but Baxter said his side would not be underestimating the Championship outfit, who have already beaten two Premiership teams on their way to the final. “Harry is a life-long friend of mine through business and football. He’s a gentleman and a tactical genius. “I’ve so much time for him and he will leave no stone unturned preparing for a football match and we will not underestimate them whatsoever. “I congratulate Harry and his team and it will be a great occasion for both of us. May the best team win. “It’s been an incredible run for us. We’ve had to beat Glentoran, Linfield, Ballymena and Coleraine to get to the final and we’ll give it a right good go, especially after not winning it for 10 years. The Crues got the job done against the Bannsiders at The Oval on Saturday evening. Speaking afterwards Baxter said it was all about the result on the day, not the performance. “Whether it’s pretty or not doesn’t concern me. You’re in a semi-final trying to win it,” he said. “The pitch was always going to be incredibly difficult; it was bumpy, beyond bumpy. “In semi-finals you have to try to keep yourself in the game and unless someone scores early, it gets incredibly night. “The first half was brutal from our perspective and the game was nullified. “It opened up when we got the first penalty and we probably should have scored a couple more but Jordan Owens missed a couple of sitters. “Then you get the controversy of the Coleraine penalty. People said it was a penalty but I’ll have to watch it back. But it wasn’t given and I can’t legislate for that, it’s not my responsibility. “But then Jordan had the courage to step up when we got our second penalty. He showed great character after missing a few sitters to bang a ball into the back of the net after missing two howlers. Baxter will be hoping for positive news on Paul Heatley who picked up an arm injury. We are a little worried, and he’s in a lot of agony,” he said.